In the weeks leading up to the Reality Tour, the newscaster from Bowienet, Total Blam Blam, asked Australian fans on the Bowienet message boards which program they would like to see David Bowie appear on. 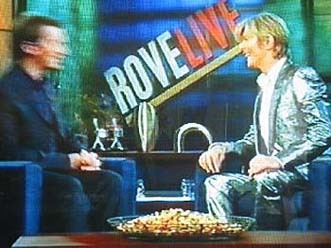 Perhaps remembering Bowie's humorous satellite interview from late the previous year, the majority of the fans suggested ROVE LIVE. 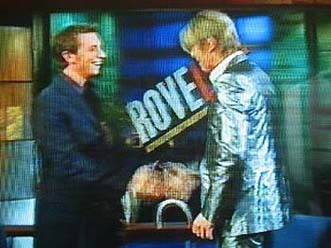 So on Feb 25 - the night before the first Melbourne concert - the promise came true and Bowie appeared on ROVE LIVE. 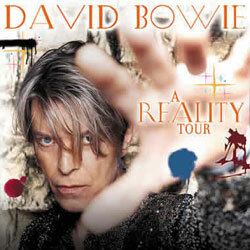 The Bowie segment of the show began with a live rendition of 'The Man Who Sold The World'. 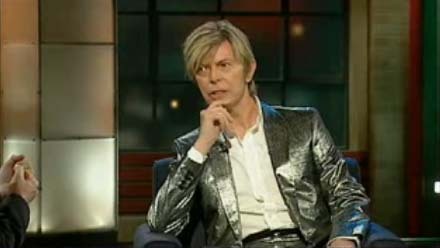 As the interview began, Rove initially fumbled saying that Bowie has "sold over 30 albums" (rather than "released" over 30 albums). 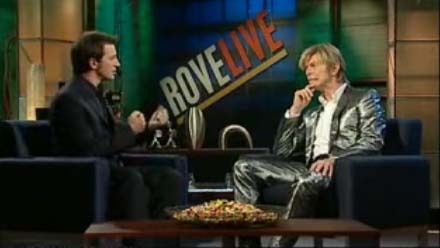 After Bowie sat down, Rove mentioned that it had been since 1987 that Bowie had toured. "78, 83, 87, those were the times I have been here before.........I always have a good time down here but this time, for some reason, it has been even better." 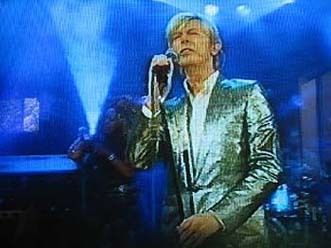 Shortly after, footage from after the Sydney concert was screened with hundreds of fans singing 'Space Oddity' as Bowie was leaving the venue. Regarding the song 'Never Get Old', Bowie said that someone his age "had to sing it" and that he was the man for the job. "It's not as silly when you sing it with a back beat". 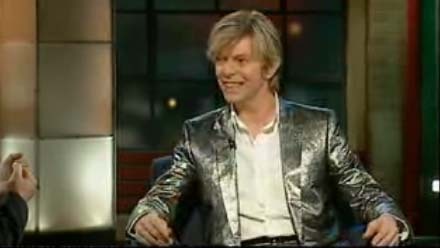 Talking about Bowie's past vices (smoking, drinking, cocaine taking), Bowie announced he was now absolutely viceless. "I wish I could come up with one.......I don't even knit. Driving......I think the way I drive is probably a vice". About this time, Bowie reached into the obligatory dish of jelly beans to pull out a pair of sunglasses. He proceeded to play with the sunglasses in funny ways as Rove tried to compose the interview. Bowie spoke about Florence Foster Jenkins for whom he explained "was a kind of socialite in the 30s in New York. She was so famous she could pay people or bribe them to come and here her sing.....and she was probably the worst singer ever in America, but she thought she could do opera." Bowie explained that most people have musicians like Hendrix in their collection but he has Florence Foster Jenkins. 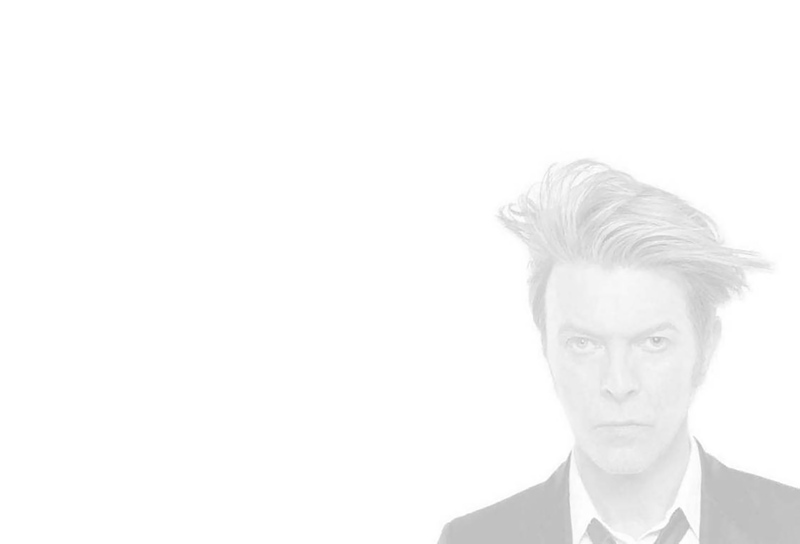 Finally, the Bowie segment closed with a live rendition of 'New Killer Star'. 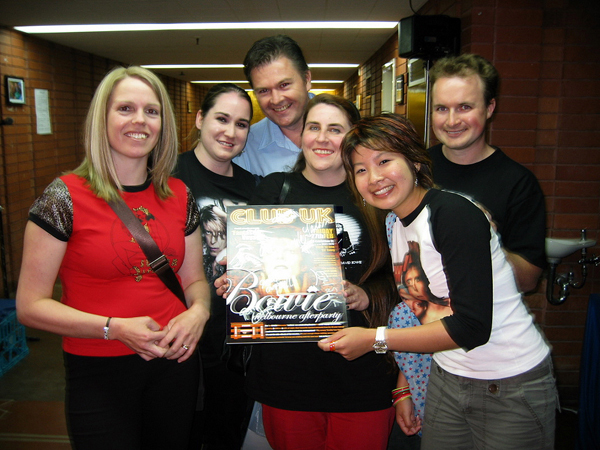 Bowie fans (left to right: Cass, Ski Louise, Harry, Louise, Georgina & Adam) after the show outside Channel 10 studios, Nunawading.